Kathleen Stokker is known for her thorough studies of Norwegian culture, and her method of comparing the experience of Norwegians to those of their emigrant relatives in America. This examination of folk medicine, mostly in the 19th century, but also in the early 20th and in ages before, demonstrates the same attention to detail, pattern and texture of folk life that Stokker has demonstrated in her other works. 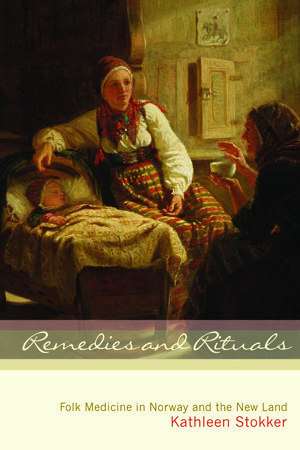 Remedies and Rituals explores the varying medicinal methods used by the almuen, Norways peasant class: herbal remedies, leeching and bloodletting, alcohol concoctions, rituals and magical formulas, and medicine made from other substances. Though the medical knowledge and understanding of these common folk (attributing disease to anything from blood aggravation to the huldre-folk, or fairies) was often poor, Stokker shows that their methods were often effective. Though she acknowledges the dismal state of medicine as practices in these traditional societies, Stokker admirably recognizes the skill, wisdom and experience held by these self-trained people, and rightfully criticizes the doctors who snobbishly denounced and often prosecuted them. As she often points out, at this time these doctors' medical knowledge was only slightly more informed than that of the peasants, and the treatment they had to offer was only slightly more consistent and effective. Ultimately, Remedies vindicates the haphazard though experienced efforts of peasant healers, shedding light on a long-darkened and qualitatively rich aspect of human experience and history. Stokker's writing is clear and straightforward, and a pleasure to read.